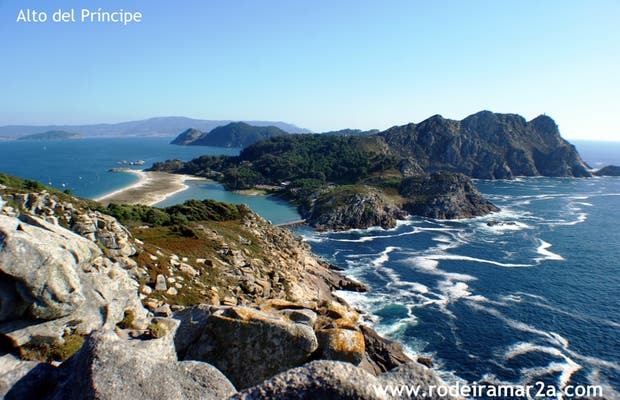 Inside the Cies Islands there are various hiking routes. We decided to record one of the most beautiful ones: the Alto del Príncipe. The level of difficulty is low and it takes about one hour (3 km). You will walk by the best beach in the world, Rodas Beach. The route begins in the Information Post, where all the routes in the island begin (there is an enormous panel that shows all the routes in colors, highlighting the level of difficulty and its interesting points). We took the right track that leads us behind the beach of Figueiras. The road is well signaled with wooden posts that tell you the distance you have left.